One of my favorite parts of any holiday is always the myriad of colors that pop up in the decorations, celebrations and menus. Easter is no exception. 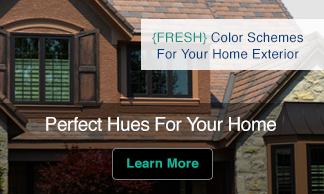 Easter eggs are some of the most unique and vibrant ways to welcome in spring. This is also a wonderful time to learn about family and cultural traditions. 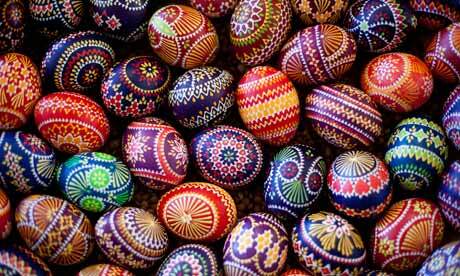 I have gathered together just a little glimpse of some of the vivid hues that make Easter eggs special and distinct, all around the world. Here in America we have carte blanche on egg-pressing ourselves artistically. These beauties are hand-painted celebrations of all things Spring. 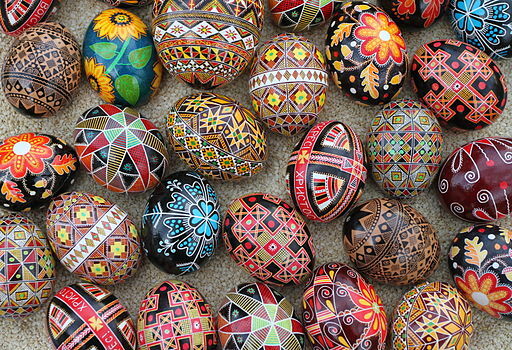 A pysanka is a Ukrainian Easter egg decorated using a wax method, which is common throughout Eastern Europe. 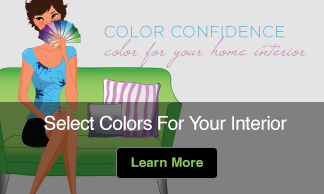 Bright colors are hand-applied with an eye on every detail. These are absolute stunners in both color and technique. 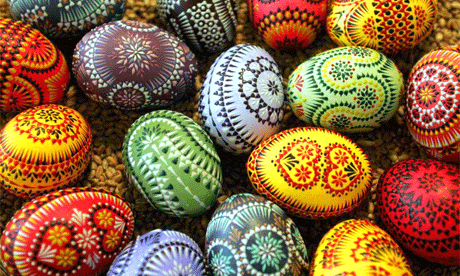 In Poland, before commercial dyes were readily available, eggs were decorated using natural plant dye. Moss may have been used for greens or black from alder bark. 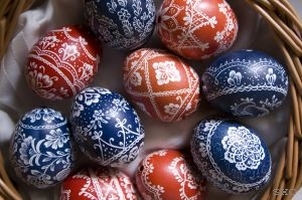 Nowadays, eggs in Poland are very intricately hand-painted incorporating lace or flowery techniques over a beeswax layer, making that shiny outer shell. 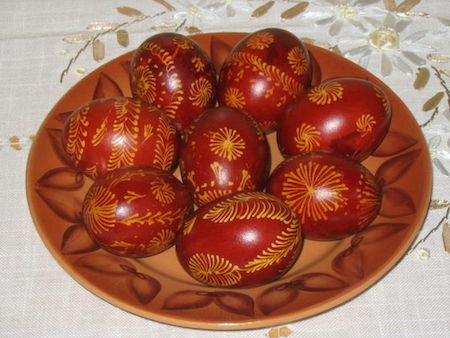 In Greek Orthodox tradition, eggs are dyed a deep, rich red as a reminder of the color of life as well as a representation of the blood of Christ. 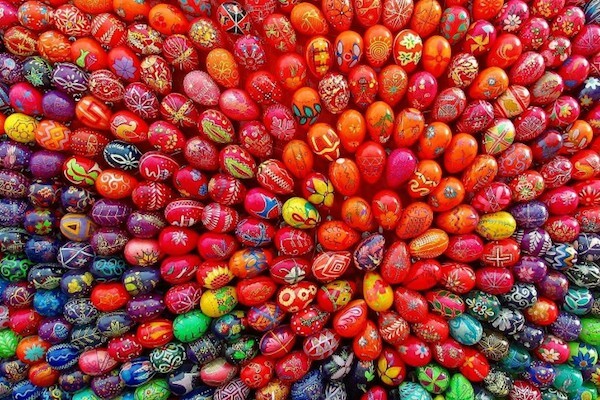 Traditionally, the egg has become a symbol of life’s renewal and the message of the red eggs is victory over death. Arguably one of the most expensive and famous eggs ever, the Fabergé egg. 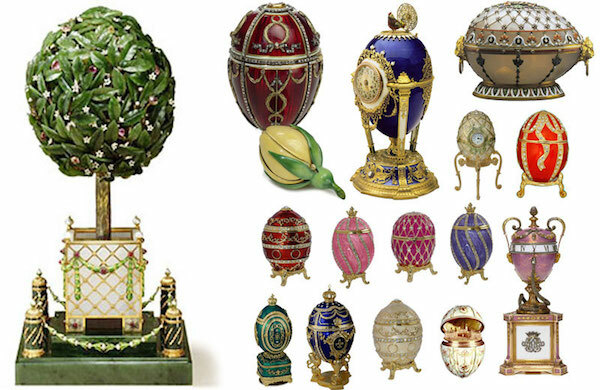 Consisting of sixty-nine jeweled eggs made by Peter Carl Fabergé and his assistants between 1885 and 1917, these one-of-a-kind works of art have become both collector’s items and a beautiful holiday symbol. Legend has it that these priceless jeweled eggs were created for the Tsar of Russia to gift to his betrothed. Whether true or not, these eggs are definitely the most expensive of all Easter egg creations! People in Hong Kong celebrate Easter more than other parts of China. Easter eggs are often decorated and then either sold or given as gifts outside of churches. Mexico, Africa and Italy really know how to pump up the volume with their Easter egg creations. Whether filled with confetti in Mexico, nature inspired African eggs or baked right into the dessert, Easter around these parts of the world is beautiful! in my opinion the eggs shown beneath the Fabergé eggs derive from an eastern part of Germany called “Lausitz” (east of Dresden). The typical and most distributed method is the multicolored batik, others are application of (coloured) wax (= Bossiertechnik), scratching white ornaments in coloured shells and nowadays very seldom writing ornaments with hydrochloric acid on a coloured egg, which leads to frayed white lines. Your picture shows wax application and a combination of batik with “Bossiertechnik” in often used colours. I believe that my suggestion is valid – can you confirm this? I’m not familiar with the egg decoration in Nepal. Can you point me to some examples. I would enjoy including them in the article.